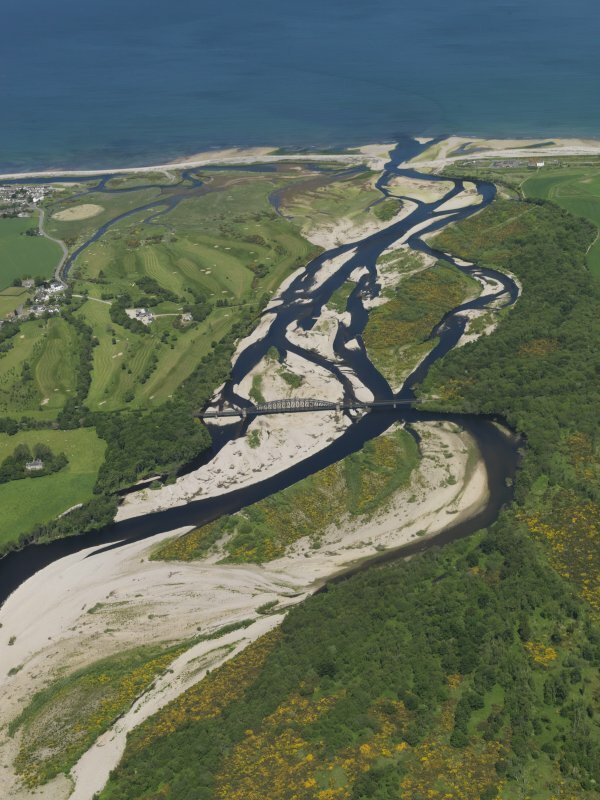 General oblique aerial view of the mouth of the River Spey centred on the Spey viaduct with the Garmouth and Kingston Golf Course beyond, taken from the S.
General oblique aerial view centred on the River Spey with Spey Viaduct beyond, looking N.
General oblique aerial view of the Spey River valley with the railway viaduct in the foreground, taken from the N.
General oblique aerial view centred on the village, taken from the NW. 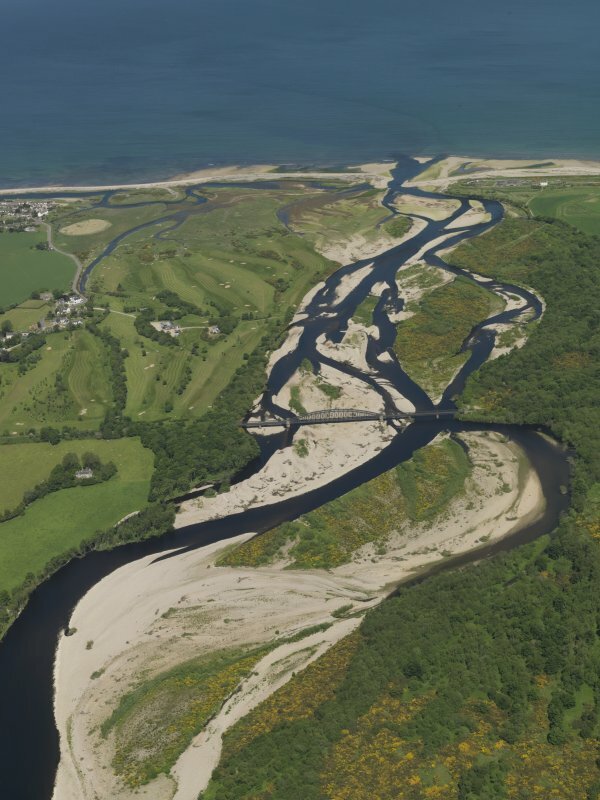 Oblique aerial view of the mouth of the River Spey centred on the Spey viaduct with the Garmouth and Kingston Golf Course adjacent, looking to the NNW. (Location cited as NJ 345 642 and parish [incorrectly] as Urquhart). Bridge over Spey, Garmouth. Opened 1886 by the Great North of Scotland Rly, engineers Blaikie Bros., Aberdeen. 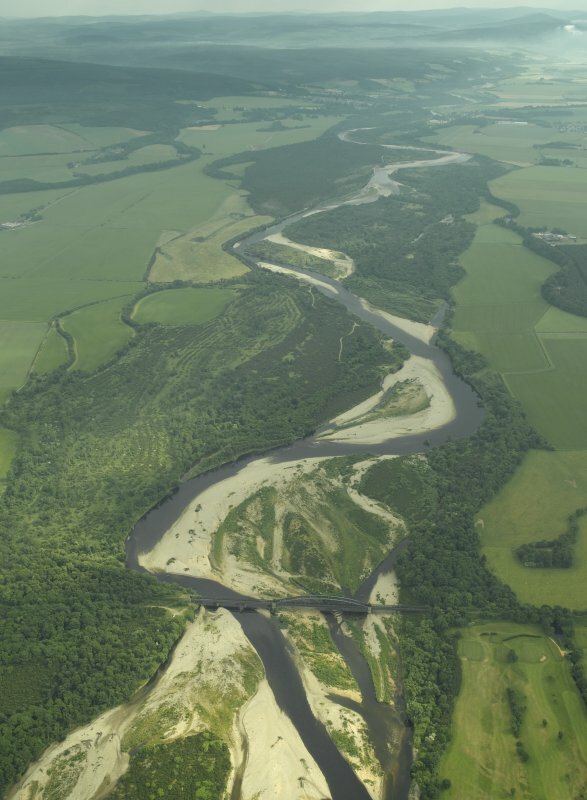 The great width of the main span was necessitated by the wandering course of the Spey near its mouth. When new, this viaduct was tested with a load of two tons of gravel in 20 trucks; it was deflected by 29mm. 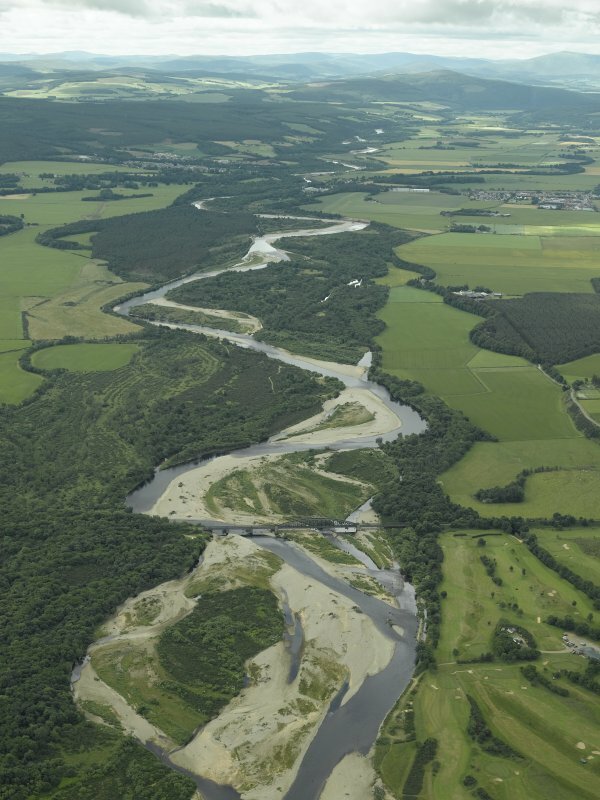 It now forms part of the (pedestrian) Speyside Way (from Spey Bay to Ballindalloch). GRC/AAS photographs: DI 28-31, DJ 11-12, DK 1-9 and AAS/85/9/S2/23 [presumably refer to the present structure]. 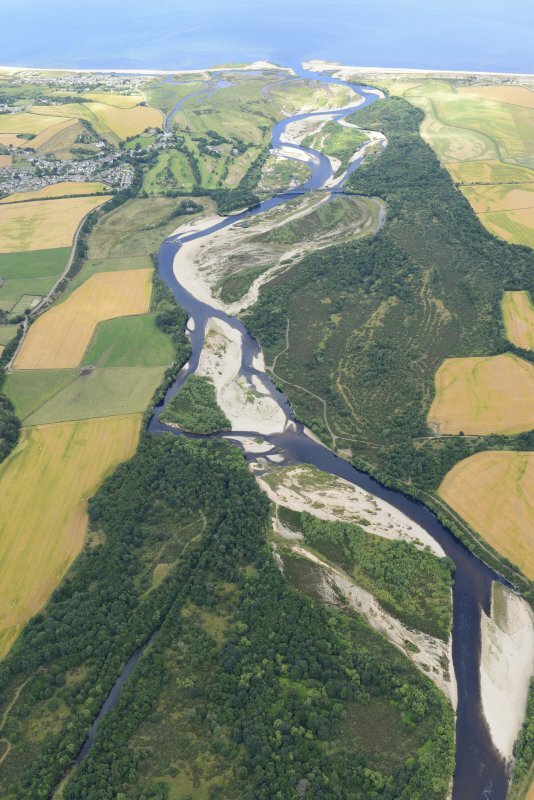 This bridge formerly carried the Elgin-Buckie section of the Moray Firth coastal route of the Great North of Scotland Rly over the River Spey, which here forms the boundary between the parishes of Urquhart (to the W) and Bellie (to the E). The location assigned to this record defines the apparent midpoint of the structure. The available map evidence indicates that the bridge extends from NJ c. 34420 64186 to NJ c. 34733 64183. Information from RCAHMS (RJCM), 7 April 2006. Built from 1883–86, was constructed to carry the Moray Coast Railway, part of the Great North of Scotland Railway. 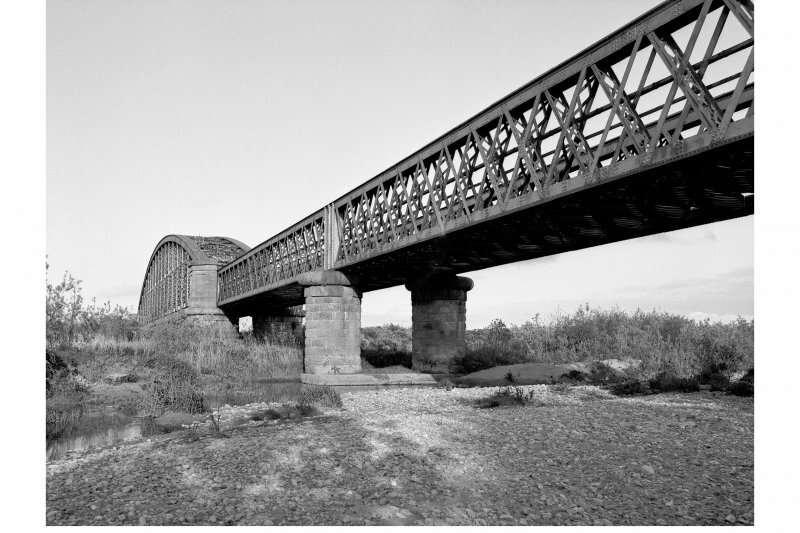 Built by Blaikie Bros, Aberdeen, in 1886 for the Great North of Scotland Railway between Elgin and the Banffshire coast, to a design by Patrick Barnett, this is an awe-inspiring iron structure thrust between river and sky. 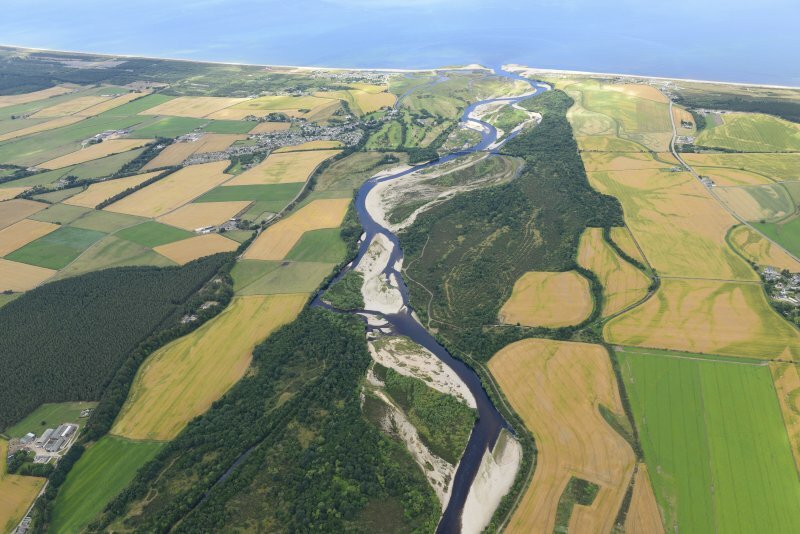 Its great length (290m overall) was determined by the Spey's habit of periodically changing channels in the broad level plain near its mouth. The solution was to build a great bowed central truss, 106.6m long and 13m high, with three 30.5m plain truss approach spans on either side, all supported on circular ashlar piers with granite capitals. 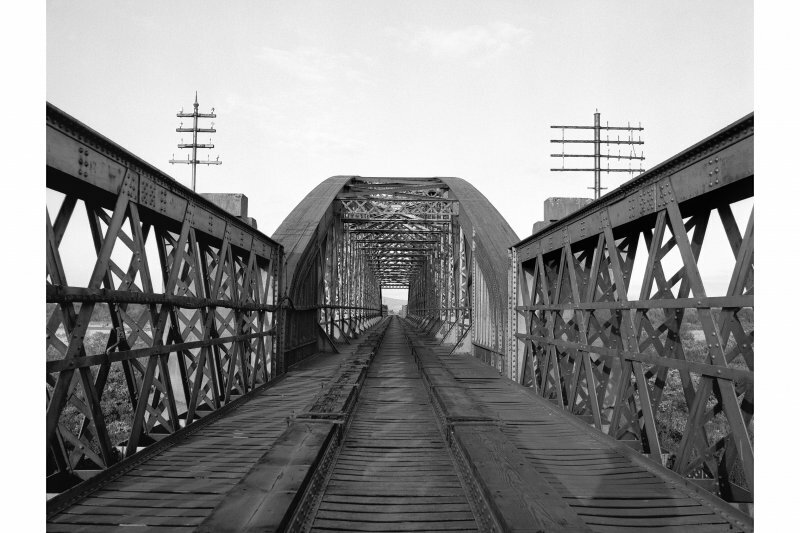 When completed the bridge was tested with a load of 400 tons of gravel in 20 trucks; the bridge deflected by 29mm. 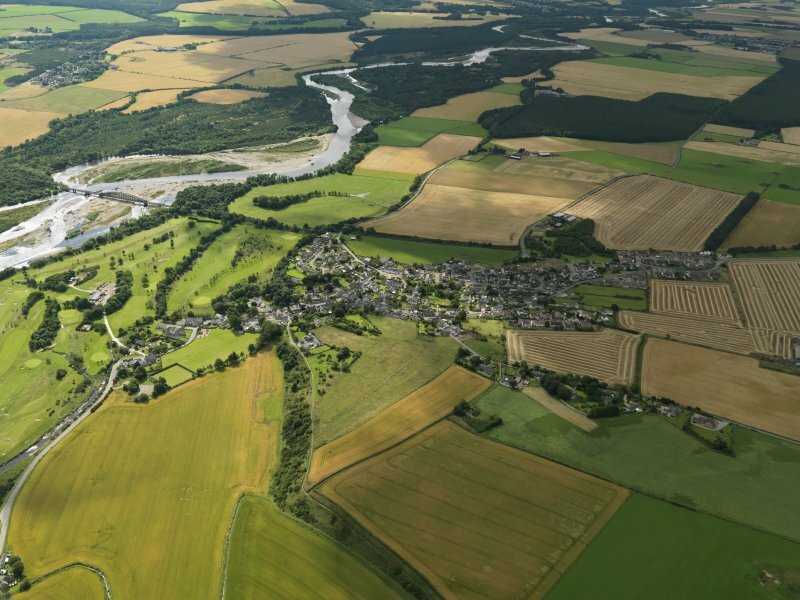 Now part of the Speyside Way from Spey Bay to Ballindalloch, the walker on the bridge can fully appreciate the confIdence of Victorian engineering in erecting this cathedral of grey girders and trusses that arch above the ceaseless, turbid Spey. Now part of the Speyside Way from Spey Bay to Ballindall och, the walker on the bridge can fully appreciate the confidence of Victorian engineering in erecting this cathedral of grey girders and trusses that arch above the ceaseless, turbid Spey. 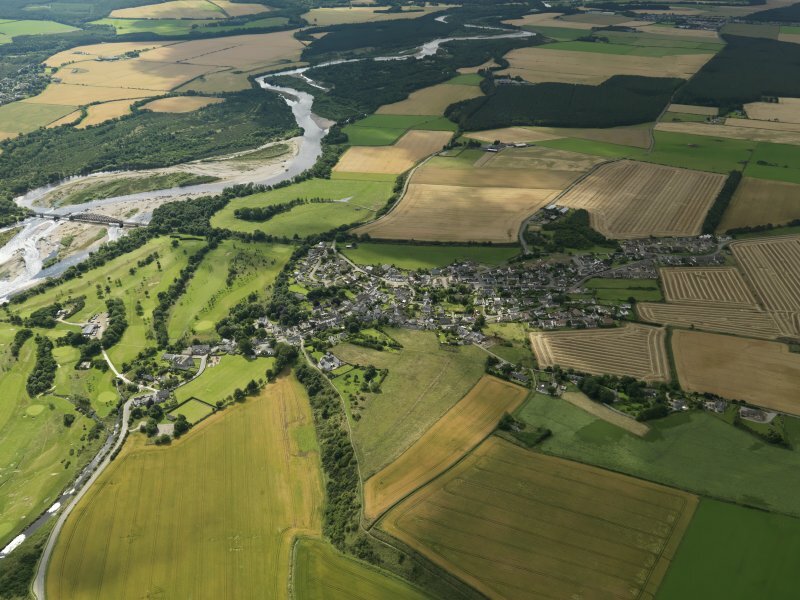 This viaduct, built from 1883–86, was constructed to carry the Moray Coast Railway, part of the Great North of Scotland Railway, over the Spey and its floodplain 1 mile south of the coast. 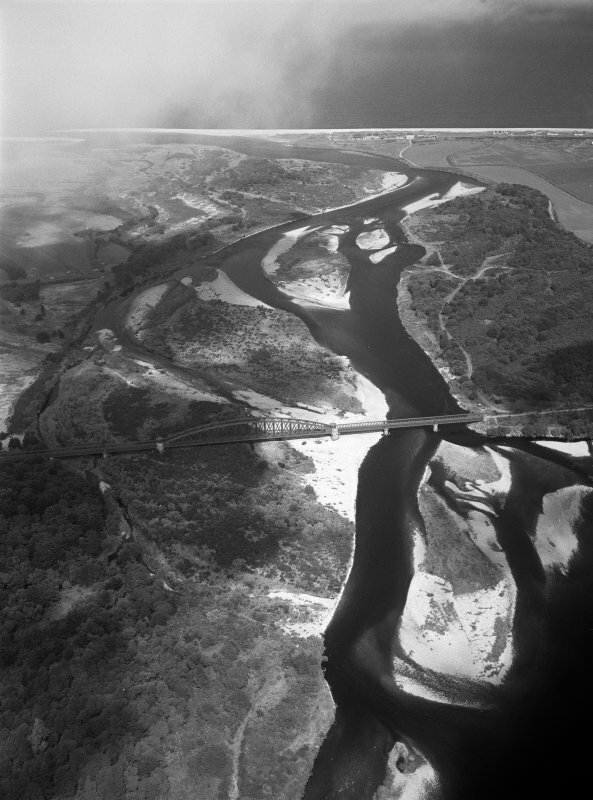 The river crossing was nitiallyconceived as three separate bridges spanning the disparate channels, but it was decided to divert the river into a single channel to be crossed on a viaduct with embankment approaches. The viaduct, 950 ft long, was built to carry a single-track railway. 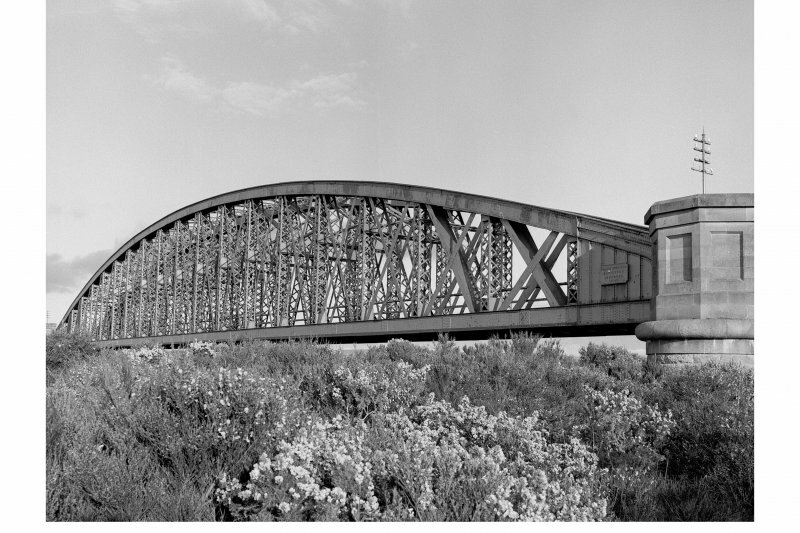 It has an impressive 350 ft long wrought-iron lattice bow girder span over the main channel of the river and three parallel-sided wrought-iron lattice girder approach spans of 100 ft at either end. The lattice members of the main arch, 41 ft deep at mid-span, rise from open box girders at each side of the deck. Cast-iron caissons filled with concrete form the piers of the viaduct. These were sunk to bedrock at depths of 25–35 ft except for the piers at the west end of the central span where it was necessary to sink them to a depth of 75 ft. 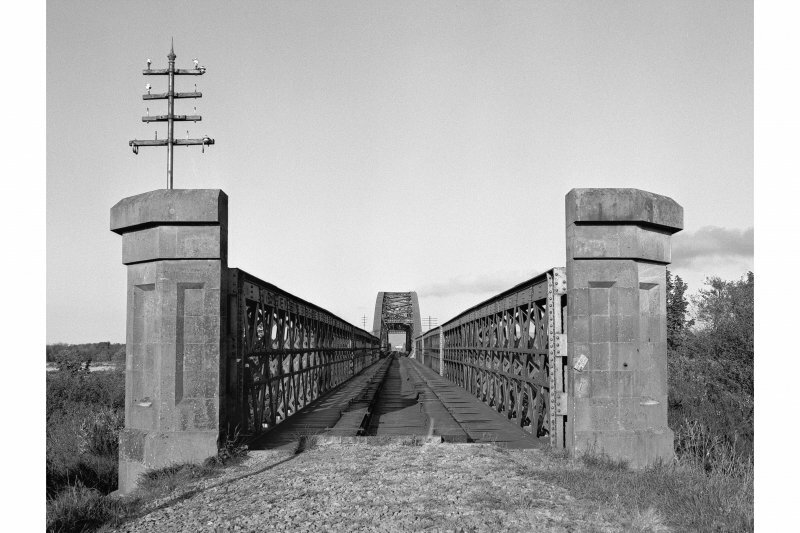 The viaduct, erected on a forest of staging, was designed by Blyth and Cunningham and Patrick Barnett, and the contractors for the ironwork of the superstructure were Blaikie Bros., Aberdeen. The contractor for the foundations and masonry was John Fyfe & Co., Kemnay. 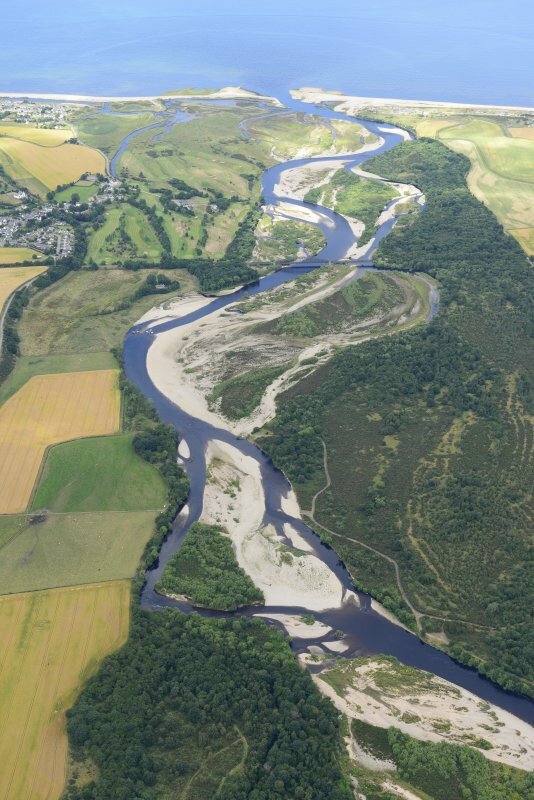 At the time of construction, the main channel of the Spey ran to the east of the viaduct, and much of the construction work and work on the concrete spine wall to control the direction of the river was done in the dry. On completion of the bridge the river was diverted beneath the central span.